Jean Pierre Cazelar was the wealthy patriarch of a prominent free family of color in 19th century New Orleans. He intended that his real estate, possessions and slaves all be inherited by his five children. However, the Louisiana Civil Code of 1808 prevented descendants of color from inheriting more than one third of his estate. The Cazelar family was able to maintain their wealth through the 19th century despite legal restrictions by defying societal expectations and even subverting the law. This is the site of their former house, though the original building no longer stands. Jean Pierre himself was a white man of French descent born in New Orleans in 1764. He formed a life partnership with Charlotte Wiltz, a free woman of color also from New Orleans. Together, they had five children: four daughters and one son. Jean Pierre owned a large plantation in Algiers, about three miles downriver of the French Quarter on the opposite bank. The plantation included the great house, some smaller buildings, a bridge and a mill. Jean Pierre Cazelar also owned dozens of slaves, which were included in his estate. Remarkably, Jean Pierre Cazelar made sure he was recorded as the father of all his children in their Baptismal Records, ensuring his paternity was part of the official record. Jean Pierre never married, had children with no other women, and lived with his children on his plantation. Historian Lawrence N. Powell identifies the public nature of interracial relationships like Jean Pierre and Charlotte's as what "set New Orleans apart from the Chesapeake and the rest of the American South" citing their freedom from "the fact that men did not lose status for transgressing racial boundaries set by slavery." The Cazelars owned several properties in the French Quarter. Five years later, he sold the lot to three of his daughters: Marie Felicite, Marie Louise “Tonton”, and Isabel Pouponne. Jean Pierre probably purchased the lot on St. Ann because his family already had property in the neighborhood. About a hundred steps away, just around the corner, were two houses owned by his partner Charlotte and his daughters Adelaide and Marie Felicite. By 1823 the entire family owned homes in the Quarter that were only several dozen steps from one another. It is no wonder that Jean Pierre Cazelar desired his children inherit his estate, which included other properties in the Quarter and his plantation. Jean Pierre Cazelar wrote three wills. The first was in 1797, so only included his daughters as heirs because his son, Jean Pierre, Jr., was not yet born. His estate included his plantation, two dozen slaves, and property in town. Cazelar wrote his own second will in 1829. He was unaware of the 1808 Civil Code that prevented him from leaving all of his estate to his children, though. In this self-authored will, Jean Pierre took care to name his daughter Adelaide specifically. He left her all of his silver, furniture and books out of gratitude for taking care of him in his later years. Jean Pierre must have learned this will would not be executed under the law, though, and made a final will in 1836. In the end, Jean Pierre Cazelar was was able to skirt the 1808 Civil Code by leaving all of his wealth to a man named Emile Sainet. Sainet was the white partner of one of his fourth daughter, Marie Louise. Sainet and the Cazelars then organized auctions and sales of Jean Pierre’s former estate, and the property was “bought” by Jean Pierre’s children. We know this scheme worked and the Cazelars maintained their wealth through subsequent generations because a record of Jean Pierre’s son, exists in the 1866 New Orleans Directory. Jean Pierre, Jr. is listed as “planter, Tunisburg, Algiers,” indicating he lived on the Cazelar Plantation. Also, his reported wealth in 1860-61 was $41,000 equal to about one million dollars today. 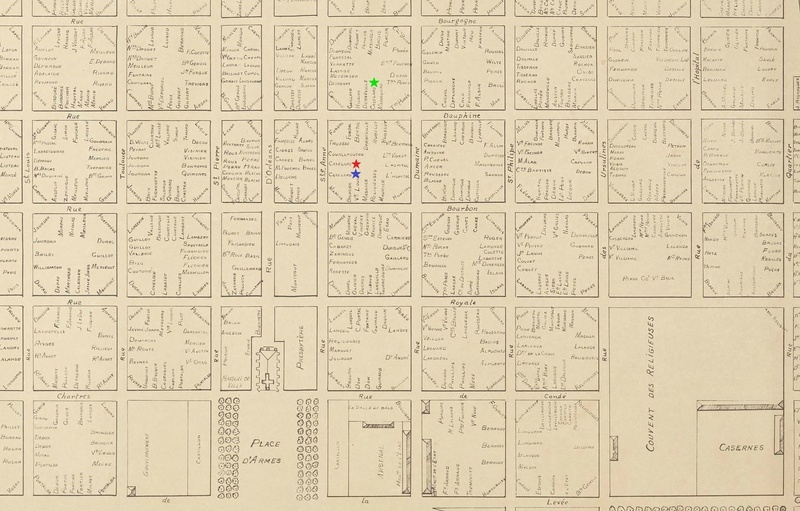 The Cazelar Plantation remained in the family until at least 1878, when it was listed as part of Jean Pierre, Jr.’s succession in an advertisement in the Times-Picayune. 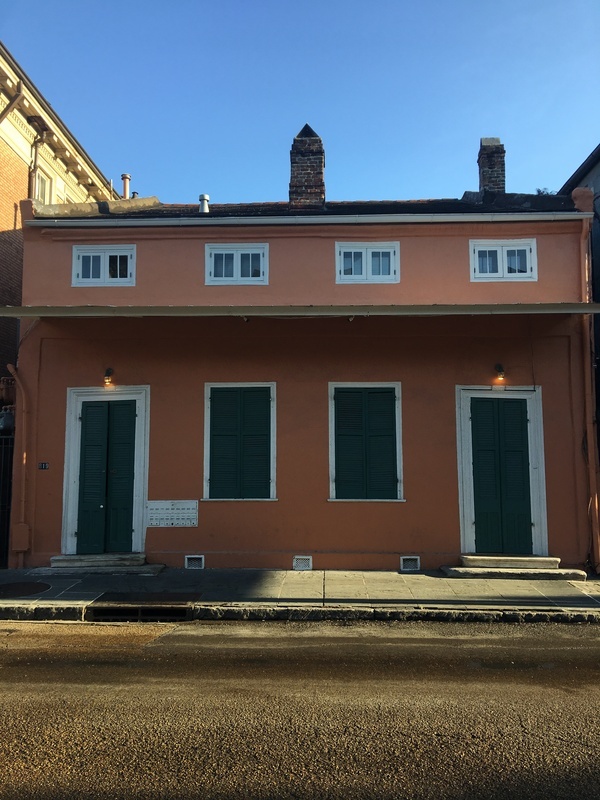 Because of his determination to take care of his children even in death, no matter the means, the Cazelars remained a wealthy New Orleans family even after the Civil War. 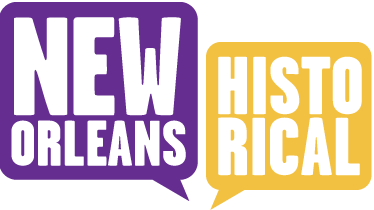 Caitlin Rudin and Editor: Kate Mason, “The Cazelars: Wealth Preservation in a Racially Mixed Family,” New Orleans Historical, accessed April 24, 2019, https://neworleanshistorical.org/items/show/1346. 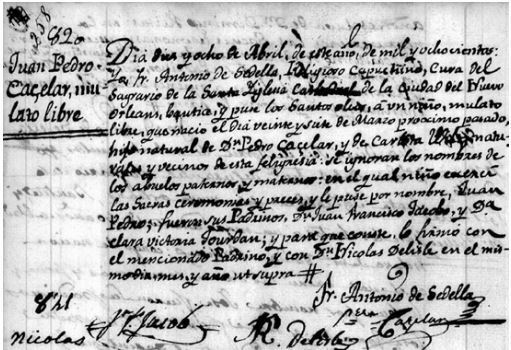 MANUSCRIPT PRIMARY SOURCES Archives of the Archdiocese of New Orleans St. Louis Cathedral Baptisms and Marriages, 1763-1766 Libro de bautizados de negros y mulatos, 1786-1792 Libro quinto de bautizados negros y mulatos de la parroquia de San Luis de esta ciudad de la Nueva Orleans: contiene doscientos treinta y sieta folios utiles, y da principia en primero de octubre de mil seteceintos noventa y dos, y acaba [en 1798] St. Louis Cathedral Baptisms of Slaves and Free Persons of Color, 1798-1801 St. Louis Cathedral Baptisms of Slaves and Free Persons of Color, 1811-1812 St. Louis Cathedral Baptisms, 1825-1827 St. Louis Cathedral Baptisms of Slaves and Free Persons of Color, 1829-1831 Libro primero de Matrimonios de Negros y Mulatos de la Parroquia de Sn. Luis de la Nueva-orleans; en 137 folios da principio en 20 de enero de 1777 y acaba en 1830 St. Louis Cathedral Marriages, 1821-1830 Historic New Orleans Collection - Ste. Gême Papers The Collins C. Diboll Vieux Carré Digital Survey New Orleans Notarial Archives Acts of Felix de Armas PUBLISHED PRIMARY SOURCES The Daily Picayune (New Orleans, Louisiana), February 21, 1878 Civil Code of the State of Louisiana, Preceded by the Treaty of Cession with France, The Constitution of the United States of America, and of the State. N.p. : 1825. Gardner, Charles. Gardener’s New Orleans Directory for 1866, Including Jefferson City, Gretna, Carrollton, Algiers and McDonough; with a Street and Levee Guide, Business Directory, and An Appendix of Much Useful Information; A summary of the Commercial History of New Orleans, Continued. New Orleans: Charles Gardner, 1866. United States Census 1810 United States Census 1830 United States Census 1850 United States Census 1850 Slave Schedules United States Census 1860 United States Census 1860 Slave Schedules United States Census 1870 United States Census 1880 United States Census 1900 SECONDARY SOURCES Clark, Emily. The Strange History of the American Quadroon: Free Women of Color in the Revolutionary Atlantic World. Chapel Hill: University of North Carolina Press, 2013. Hall, Gwendolyn Midlo. Databases for the Study of Afro-Louisiana History and Genealogy, Louisiana Slave Database. Baton Rouge: Louisiana State University Press, 2000. Electronic version; www.ibiblio.org/laslave (accessed November 20, 2016) Powell, Lawrence N. The Accidental City: Improvising New Orleans. Cambridge, MA: Harvard University Press, 2012. Rankin, David C. “The Origins of Black Leadership in New Orleans During Reconstruction.” Journal of Southern History 40, no. 3 (August 1974): 417-40.